Let us now discuss the representation of the enactment of the plan created in the previous section. Naturally, enacting a plan is just a series of actions. What we are interested in is how the enactment in the real scene will relate to the planning scene. The problem of how the plan drives the agent’s concrete actions is an issue of story steering, and us such is beyond the scope of this paper. Nevertheless, even if we are looking at the agent from the outside, we still need to find the correspondences between his plan and its actions. To illustrate this internal view, let us discuss the representation of the following statement, which is a continuation of the one in the planning ahead section. So John went to the kitchen and opened the fridge. The fridge was empty. "John" / goes-to / a kitchen. the kitchen -- in -- "plan". "John" / open / a fridge. the fridge -- in -- "plan". The fridge / is-a / empty. 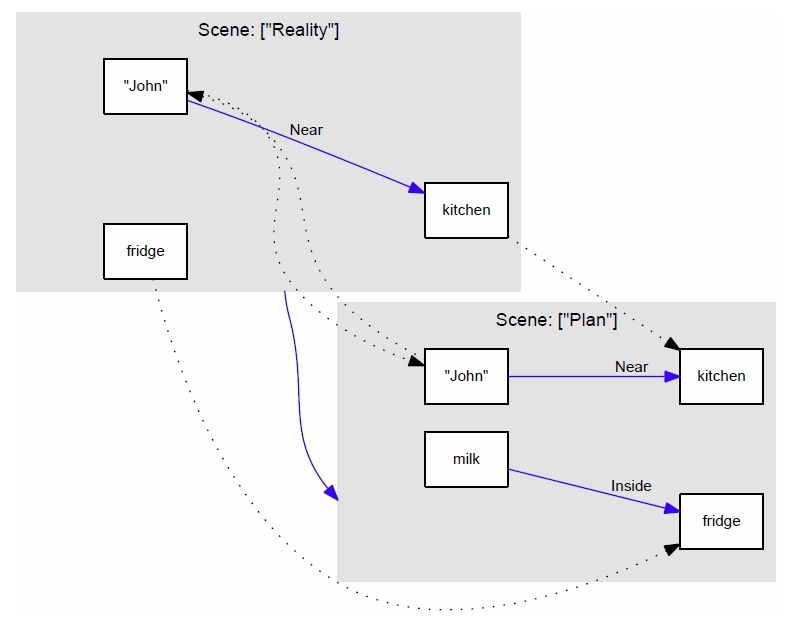 The relation between the plan and its execution is reflected in the identity relations: for instance, the kitchen into which John went is identity-related to the one in the plan. In the story snipped above, the identity relations are explicitly created in the story. In other circumstances, these relations can be inferred by the agent through a missing relation inference. It is also possible that a fast and careless reader (such as a Xapagy agent presented with a sequence of statements without interstitial pauses for the creation of headless shadows) would not even notice that what John is doing is actually an enactment of the plan.